E-Reserves Workshop in Ottawa — Atlas Systems, Inc. This past Friday, Carleton University hosted an E-Reserves Workshop for area libraries to attend. Coming from Virginia, I expected it to be cold, but even by Canadian standards it was a bit harsh. The severity of the weather was outdone by the warmth of everyone I met, though. Joanne Rumig is the Coordinator for Library Reserves Services at Carleton’s MacOdrum Library and was the mastermind behind this workshop. She graciously offered to pick me up from my hotel and navigate me around campus. When she pulled up to the hotel, her doors were still frozen shut. Welcome to Canada! After meeting everyone and getting the best cup of Tim Horton’s coffee, it was time to buckle down. We started out with a review of what’s new in Ares. That gave me an opportunity not only to talk about Atlas’ development plans but to remind them how important their feedback is in UserVoice. Heather Martin from University of Guelph gave a great overview of the survey they conducted on campus to find out if students were buying their textbooks and if so, why not. She pointed out several ways that the library could help those students by keeping a copy on reserves, communicating with instructors proactively, and extending usage time limits. Kevin Bowrin and Marc Lewis presented on some tips and tricks they are implementing at Carleton to allow users to more easily submit items from citation trackers (like EndNote) and how to catch and clean up user data from their course and user loads. I was able to sit with several Ares sites over lunch to talk about possibilities for better handling physical reserves. It was great to hear from users directly and brainstorm together. Interestingly, the portion that was most beneficial to everyone was when Carleton staff gave a tour of their reserves area and talked about their processes. I learned that Carleton’s library has hundreds of board games on reserve! And they wrap all the instructor provided books in red covers to protect them and make it obvious. Staff took others to their personal workstations to show them the Ares client, their filing systems, and compare notes. It was very eye opening for everyone! Carleton invited faculty and students from campus to answer questions about how they use E-Reserves and get their unique perspectives. It was fantastic to hear from users directly and built a lot of community. Lastly, we heard from Lisa Di Valentino about the recent copyright judicial rulings this summer in Canada. She gave an excellent overview of how the tariff and Access Copyright have affected fair dealing in Canada over the last 10 years. We are all anxiously awaiting the appeal results from York University. 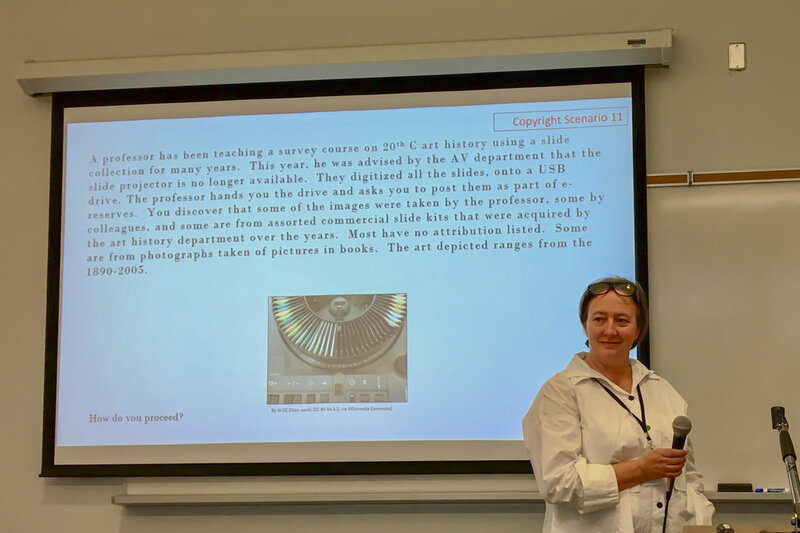 In addition, Val Critchley from Carleton created an amazing set of copyright scenarios to discuss. I admit that when I first read the scenarios, they all sounded impossible to determine the right path. But as we went through them, they became increasingly clear. It’s very reassuring to not only provide a material to instructors and students, but to know that you’re well within the guidelines doing so. The exercises were a real confidence booster for me. As everyone packed up, there was already excited talk of “the next workshop” and who would host it. Everyone agreed that seeing each other face to face and comparing notes was incredibly valuable and worth braving the cold.